The series of Emerging Artist gigs that are taking place at London’s Crazy Coqs is a potentially exciting showcase for new talent in the arenas of both performance and also creativity. The guru behind the events is Simon Greiff, long recognised as a champion of the talent that is to be found breaking through in musical theatre. Three writer/composers were showcased in the April session, Jonathan Eio, Ella Grace and Dan Looney. All talented musicians for sure, far more talented than this critic and all able to structure a song with a respectable number of verses, a key change and a middle eight that works too. But it was a disappointment that too many of the evening’s numbers bore the hallmarks of bland ballads. The human condition has long been the driving force of strong musical theatre and songs about relationships are all very well and good. But, there’s a difference between just writing a song and writing a good striking song that hooks the audience. All too often there wasn’t enough imaginative bait on offer to make me want to bite, either in terms of an exciting melody or truly witty lyrics. That being said, whilst Eio’s When You Were Mine may have been lyrically trite, Adele Pope’s delivery of the song was rather gorgeous. Elsewhere in the programme Grace’s Promise Me tackled the challenge of violent abuse. A dark subject for any song (Suzanne Vega nailed it years ago with Luka) and whilst Kay Hindmarsh sung it beautifully, the lyrics veered from being painfully percepetive to at times being shallow and occasionally patronising. These are criticisms that I suspect could not have been further from Grace’s mind when she penned the number, her song simply needs more work. Dan Looney’s work was generally excellent. His Swear Our Love, about a young man with Tourettes, was a brave song that trod very thin ice. To write a witty song about a disability requires profound sensitivity and tact and Looney got the balance just right, showing judgement and maturity in his lyrics. Looney was also blessed with two of the evening’s stellar performers. Seasoned young star Matthew Rowland served his Excalibur 93 number very well, whilst Mollie Melia-Redgrave was a stunning Ditsy Blonde. Not really an emerging talent, more a leading-lady in waiting, Laura Pitt-Pulford graced the stage with Eio’s Sandbox. Pitt-Pulford only really knows to do “fabulous” when she sings and this song proved no exception. A cracking performance as ever, which also seemed to truly tickle the hen party that staggered in to the Crazy Coqs half way through her number! 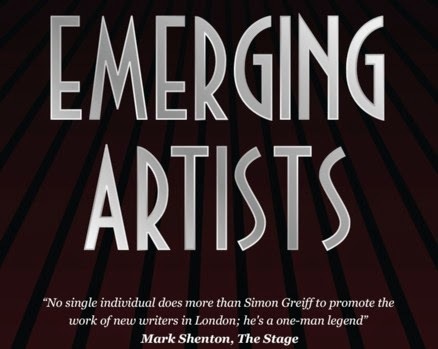 Talent showcases will always present a variety of abilities and whilst it is proving hard to discern an emerging wit to match the the likes of a young Rice Sondheim or Schwartz there is definite potential amongst today’s young composers. The venue was packed, the show only lasted an hour and it costs a tenner. And all this all takes place in one of London’s most elegant art deco cabaret venues. Greiff’s next gig in the series is on Saturday June 7 and if you care about the future of the genre, it’s well worth attending.